WASHINGTON — President Donald Trump observed the 16th anniversary of the 9/11 terror attacks Monday, his first presidential remembrance of the attack that killed nearly 3,000 Americans. The president, joined by the first lady, called the occasion "extraordinary." "Our values will endure. Our people will thrive," Trump said, speaking at the Pentagon in tribute to those who perished there on 9/11. "Our nation will prevail and the memory of our loved ones will never, ever die." Trump, alongside Defense Secretary James Mattis and Joint Chiefs Chairman Gen. Joseph Dunford, spoke to America's strength in the face of hardship. "The terrorists who attacked us thought they could incite fear and weaken our spirit, but America cannot be intimidated," Trump said. "And those who try will soon join the long list of vanquished enemies who dared to test our mettle." 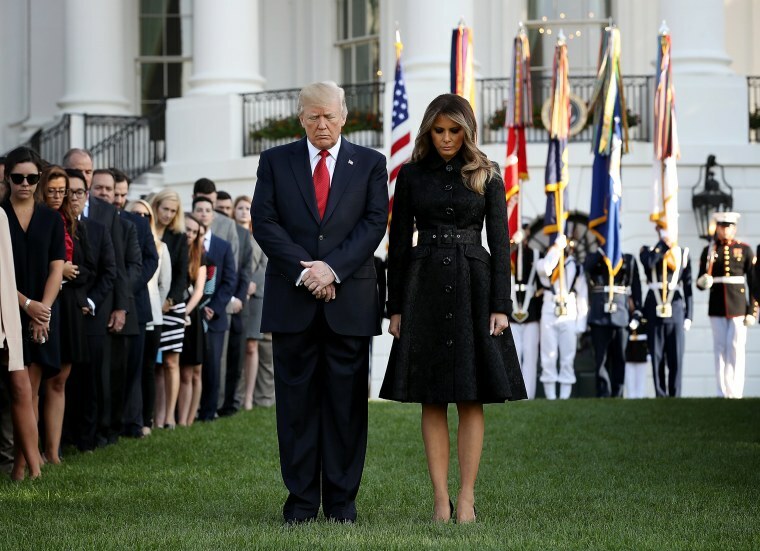 Prior to going to the Pentagon, the president and first lady stood stoically on the White House South Lawn, bowing their heads in honor of the moment that the first plane hit the north tower of New York's Twin Towers. White House staffers joined them on the lawn. Vice President Mike Pence observed the solemn day in Shanksville, Pennsylvania, the site where United Airlines flight 93 crashed. The anniversary came as the nation faced another week of devastating storms ripping through the South, with Trump sending prayers to those in the storm's path. "When Americans are in need, Americans pull together," he said, adding that "when we face hardship, we emerge closer, stronger and more determined than ever." Last year, Trump joined in a bipartisan 9/11 ceremony in downtown Manhattan that became a heated political moment in the presidential race after Hillary Clinton, then the Democratic nominee, appeared to stumble as she was leaving. A video later made its way into Trump campaign attack ads.